Plastic blow molding product types | Silver Python Machinery Co., Ltd.
1 round container, is used to do more is also a larger amount of a shape, such as different volume of the barrel barrels and so on. Mainly used for cosmetics and other materials, daily necessities and storage and storage. 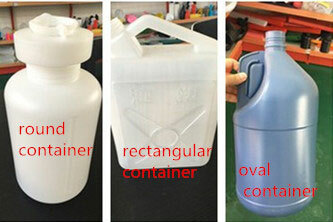 The main feature of this type of container is the large capacity, the use of materials, blow molding wall thickness is easy to control, mold processing is easy, low cost, but the transport area than the rectangular container.